The scientific understanding you need for the choices you make. 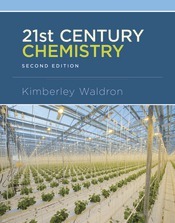 Waldron 21st Century Chemistry promotes scientific literacy and helps students understand chemistry applications in everyday life. With an exceptionally clear and fresh writing style, Waldron engages non-science majors and provides a focus on environmental topics with Naturebox and Green Beat features. Recurring Themes help students remember fundamental, take-away ideas and concepts so they can apply their knowledge of chemistry as they make choices as consumers, voters and overall informed citizens. new content featuring fresh stories for roughly four of the Naturebox features and roughly three of the GreenBeats features. refreshed end-of-chapter content, including questions encouraging students to research their local environment using web resources. current events and real-world applications, and LearningCurve reading quizzes.